After his first production 'PK', which created Box Office record, Rajkumar Hirani comes up with his second venture 'SaalaKhadoos' under his banner Rajkumar Hirani Films. Written and directed by Sudha Kongara Prasad, the film is being simultaneously made in Hindi and Tamil, as 'Irudhi Suttru'. Touted as a bilingual, sport, drama, the film, features R. Madhavan in the lead as a boxing coach. 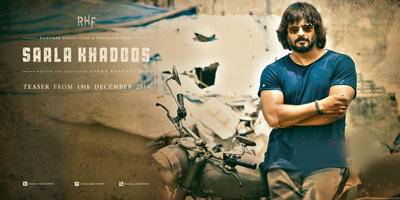 'Saala Khadoos' is about a rustic fisherwoman, played by Ritika Singh who Madhavan's character, a badass boxing coach, groom's into a match winning boxer. The film revolves around Madhavan who is relentlessly is pushing his protege, Ritika to overcome obstacles and achieve her goals. The film is all set to release on 29th January 2016.